As promised, I’m back with a look behind the scenes of the campaign for Jack Marchetti’s 4 OF A KIND. When we were prepping to launch this campaign, we went back and forth on how long the campaign should be, with the link ranging between 32 and 39 days. We knew we wanted to end on a Friday (depending on which time zone you’re in), so the real question was, which day do we launch? We settled on 39 days for the simple reason that we thought we might need a little more time for momentum to build, considering that Jack doesn’t have an established audience. If you’re a “name”, it’s more likely that you can get off to a strong start, like Joke & Biagio did. If you aren’t, it’s going to be a slower build. It’s going to take long for you to find your potential backers. You can’t just email the 500 dedicated fans on your mailing list. Still, it’s going slower than we’d like. You don’t need me to tell you the red line should be higher. Am I worried? Yes and no. Obviously, we want it to be higher. But we’re building a base. And there’s chances to catch up. There’s days where the model thinks we’ll raise as little as $400. So we don’t need to panicâ€¦yet. 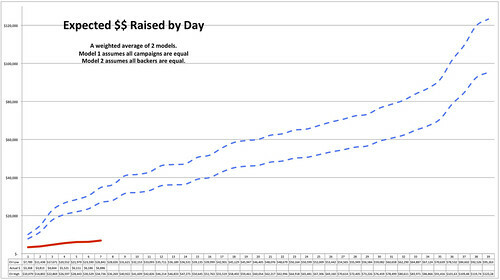 Right now we’re running at $51/backer, up a tick from Friday when it was $48/backer. That’s a little low. We want to be around $70/backer. We knew that by putting the download at $5 that we’d have trouble getting up to $90/backer that a lot of film campaigns get, but that’s kind of by design. Jack being an unknown, we figured we wanted to make backing the campaign as low-risk as possible. You get to see the movie for $5. That’s a pretty good value. But, of course that’s going to drive down the average pledge. 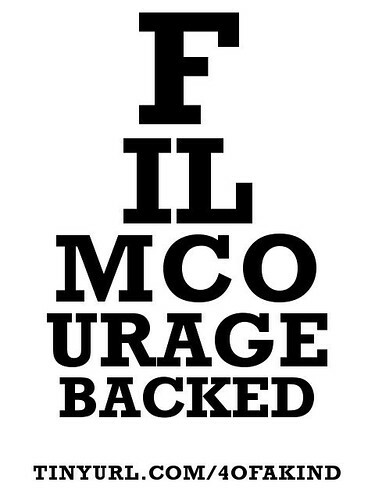 During the campaign, we’ve been making eye charts with the names of our backers on them, as a personalized thank you. It’s not a perk, just something we’re doing in the hopes that people will use them to spread the word about the campaign (and they are). They’ve been more popular than expected. So on Friday we added them to the perk list at $75. We’ll still do them for every backer, but at $75 Jack will turn a slightly fancier version of it into a poster for you, which he’ll sign. It’s some nicely personalized swag. Part of the hope is that’ll up-sell a bunch of the $50 backers, or even some of the $5 backers. If it does offend some people, I’d rather fail at this, then take down some imagery that had nothing to do with something as some sort of an implicit recognition that gun imagery on a poster would aid some psychopath into shooting a room full of strangers. He’s right. I’m not sure I would have had the guts to keep the image. So we keep battling, because Jack is still battling and if you can’t get behind the cause of someone using what little time they have to make an independent film, then what can you get behind? This is why we have a community, to make things like this possible. Lucas McNelly is the filmmaker behind A YEAR WITHOUT RENT, UP COUNTRY, BLANC DE BLANC, and GRAVIDA. He hasn’t lived anywhere in a long time. BASS ACKWARDS – Watch It Now!